It’s not easy to detect cancer, especially when still at an early stage. 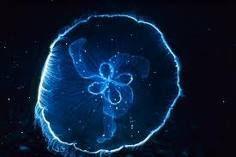 But, by utilizing the protein in a jellyfish glow in the dark of the famous deadly toxic, cancer can be detected early. When swimming in dark waters, the jellyfish looks light because it contains proteins that are fluorescent or can be fluorescent. Emitted green light is not only beautiful to look at, but also inspire the British scientist to use it. Professor Norman Maitland from Yorkshire Cancer Research Laboratory, managed to isolate the protein in the laboratory at York University and injected cancer cells. With a special camera, the protein seemed to glow when reacts with abnormal cells. "The technology available today such as X-rays much less difficult to penetrate into the bone tissue, making it difficult to detect microscopic bone cancer. Jellyfish protein can help overcome them," Prof Norman said. When the camera is activated, the jellyfish protein that will always be bound to the cancer cells more easily detected because of its glow. Prof. Norman called the scanning process with this special camera with Virimaging terms, abbreviations of virus imaging. As the name implies, the jellyfish protein is indeed incorporated into the cancer cells in the form of the virus. The workings of the virus has been designed to attack only cancer cells that are guaranteed not misplaced because it does not attack healthy tissue. Although very promising for cancer treatment, Professor Norman admits that they took less than 5 years into the future for this technology could be applied to humans. Currently trials are done is still limited to laboratory scale.